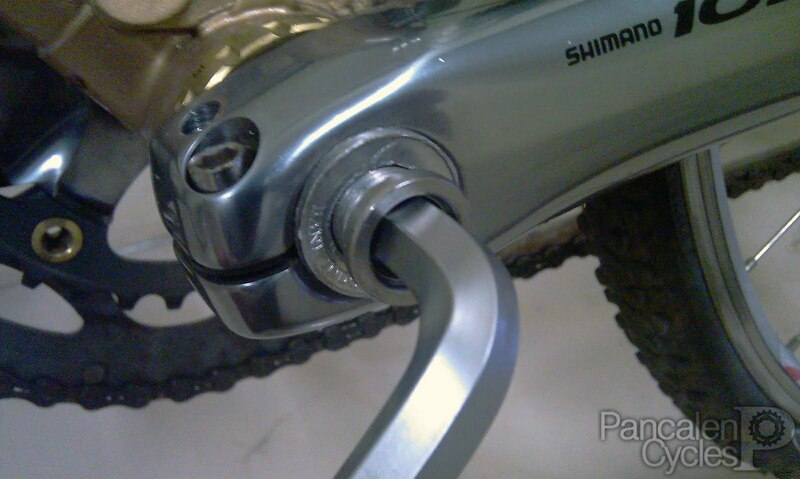 So you're using Shimano outboard bearing crankset. One day, suddenly your left crank arm just fall off. Your plastic crank arm fixing bolt is missing. There supposed to be a black plastic bolt on the center of that spindle. Now it's missing, and all you can see is its threads. These plastic bolts is rather hard to find here in Indonesia. Source them elsewhere? I'm sure we're not patient enough to wait for the shipping. But wait. If you're using one of these cranksets: early edition Shimano outboard bearing mountain cranksets such as Deore LX's FC-M580, or any Shimano outboard bearing road cranksets such as Sora's FC-3400, Tiagra's FC-4500, 105's FC-5600, or Ultegra's FC-6600, fear not. With a little tinkering, you'll be able to ride your trusted steed once again. Shimano specifies two fixing bolt sizes, the smaller ones (as used on the cranksets I listed before) and the larger ones that's used on newer generation Shimano mountain cranksets, Ultegra's FC-6700 and Dura Ace's FC-7900. This method only works on cranksets using small fixing bolt, so if you're using the larger ones... tough luck, Sir. Keeping small changes really come in handy. The Octalink fixing bolts are easier to find, have a visit to one of large bicycle shops near you. 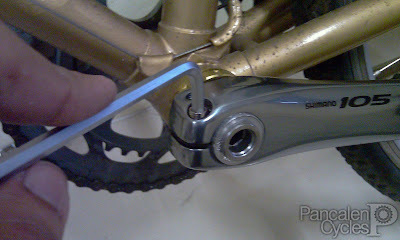 Since the bolt is small enough to hold the left crank arm in place, we need a washer to perfectly suit them. 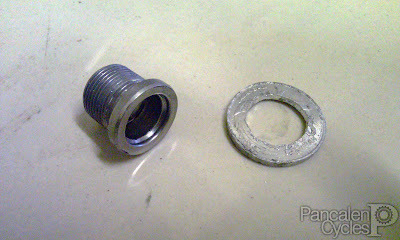 Since rust resistance is critical on a weather-abused bicycles like mine, I made the washer from a Rp 200 coin (don't ask me how big is that hole in the middle, I did it with a manual vice). The outer diameter fits snug. Slip the coin/washer on the bolt, and voila, your own makeshift Shimano outboard bearing crankset fixing bolt. to tighten the fixing bolt. Just plain old 10mm Allen wrench. ...then tighten two pinch bolts on the crank arm. Do it one turn at a time for each bolt, to ensure equal torque. Hold it. Wait. 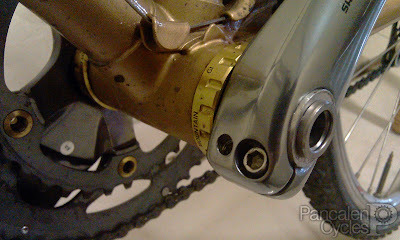 Is that gold outboard bearing bottom bracket cups with "Mountain" label written on it? Why yes. 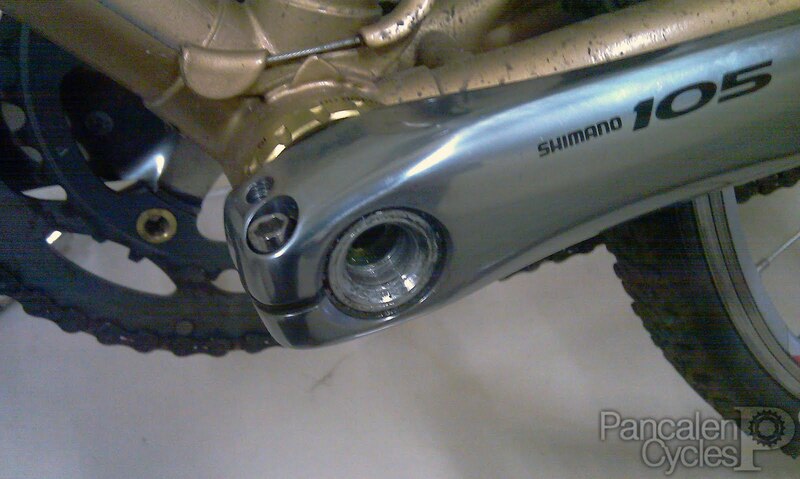 That's a pair of Shimano Saint bottom bracket cups (SM-BB80), paired to Shimano 105 (FC-5600) crankset. Since Saint's drive-side cup thread is a bit longer (designed for 73mm bottom bracket shell, plus chain guard mount), I have to lathe them to fit my bike's 68mm shell. Overkill? Maybe, but if you find Saint cups labeled with the same price tag as Tiagra cups on your local bicycle shop, you'll know which one to choose. A nod to my mountain biking roots. And it matched with all those gold components on my bike.